Acupuncture has been practiced on animals almost as long as it has been practiced on people, with first reports of its utilization for the treatment of certain conditions in animals dating to as early as 3000 years ago in China. Traditional Chinese medicine describes a system of channels or meridians, which control the flow of “chi” or energy. Most illnesses and injuries are either caused by or accompanied by disturbances in the flow and balance of “chi”. Disorders in the function of “chi” can be influenced by treating acupuncture points. The Western, with regards to how acupuncture works, is complicated but involves a bioelectric, humeral, or neurophysiologic theory. Basically, acupuncture points can alter electric fields, release humeral substances such as endorphins and other neurotransmitters such as serotonin and dopamine, and/or effect peripheral nerves, which send a neurologic message which ultimately modifies the mechanisms which ordinarily regulate and control an animal’s physiology. Although many of acupuncture’s physiological effects have been studied, much more are still unknown, and research is being conducted to determine the scientific basis of those effects. The principles behind this art and science of healing aim to correct these imbalances in the body by using needles inserted into specific acupuncture points. Before considering acupuncture therapy, patients should have a comprehensive examination and diagnostic workup including but limited to complete blood work analysis and radiographic evaluation. The veterinary acupuncturist (who is a licensed veterinarian with additional training/certification in veterinary acupuncture) will usually ask questions regarding your pet’s general health, diet, temperature preferences, current symptoms, and overall energy or activity level. Acupuncture is performed with very thin, sterile needles. 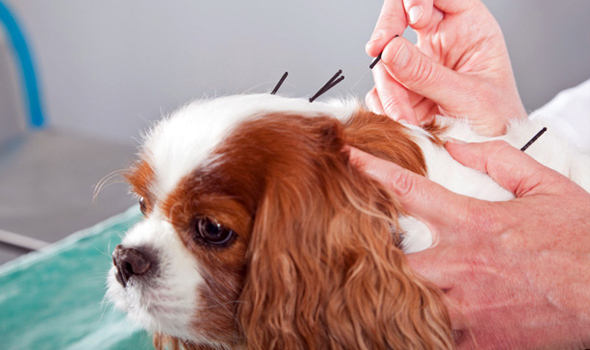 The acupuncture needles are inserted by the veterinarian into specific points of your pet’s body, which he has decided to use based on his physical examination findings. These points are usually a part of an acupuncture point formula or a collection of individual points chosen to address the imbalances detected during the examination. Insertion of the needles is not usually painful and is tolerated extremely well, but a very sensitive or painful pet may show a mild reaction. Depending on the diagnosis, the veterinarian will either leave the inserted needles without touching them or twirl the needles intermittently. Duration of needle insertion is also variable and will be based on you pet’s condition. Additional steps in the treatment could be an application of a low voltage electric current (electro-acupuncture) provided by a small device via wires attached to the needles. The needles could also be warmed by the application of heat from a burning Moxa stick (these are herbs rolled into a cigar shape and ignited) or a heat lamp (called a Chi lamp) could be used over the needled areas. Recently we have been using a 12-watt medical laser therapy unit which has acupuncture capabilities. Depending on the diagnosis, the veterinarian will either leave the inserted needles without touching them or twirl the needles intermittently. Duration of needle insertion is also variable and will be based on your pet’s condition. Additional steps in the treatment could be an application of a low voltage electric current (electro-acupuncture) provided by a small device via wires attached to the needles. The needles could also be warmed by the application of heat from a burning Moxa stick (these are herbs rolled into a cigar shape and ignited) or a heat lamp (called a Chi lamp) could be used over the needled areas. Recently, we have been using a 12-watt medical laser therapy unit which has acupuncture capabilities. After a period of time, usually 15 to 30 minutes, the needles are removed. Most animals relax and tolerate acupuncture very well, often falling asleep during treatments; a small number will be panting and restless. Patients usually start with 1-2 treatments per week for 4-6 weeks. A positive response is often noticed within the first 3-6 treatments and sometimes sooner. Once a maximum response is achieved, treatments are tapered off and pets may only need to be seen occasionally. Studies have shown that acupuncture has a generally positive effect on the body because it stimulates the release of hormones, pain-killing chemicals, and anti-inflammatory substances. All of these substances have a beneficial effect by promoting tissue repair and improving blood circulation resulting in pain relief and a sense of well-being. Local effects of acupuncture consist of relaxation of muscle spasm or “trigger points” during the acupuncture session. Acupuncture has certainly proved to be beneficial for many of the patients in our hospital. While acupuncture is known for having beneficial effects for a wide variety of conditions and diseases, it is most commonly used for alleviation of pain. We are currently using acupuncture for a variety of conditions including but not limited to degenerative joint disease, muscle soreness, intervertebral disc disease, paralysis, chronic pain syndromes, and even allergies. Additional general conditions that respond to acupuncture include epilepsy, acral lick granulomas, respiratory problems such as asthma, and gastrointestinal imbalances such as diarrhea or constipation. Cancer patients may benefit with pain-relief and a decrease in side-effects from chemotherapy. It’s important to realize that acupuncture is an important adjunctive therapy for supportive therapy and symptomatic relief. Acupuncture is not a cure-all, but rather a therapeutic modality that can be used simultaneously with other more traditional methods of veterinary care. Acupuncture is one of the safest therapies utilized in medicine if practiced by a properly trained and certified veterinarian. Side effects are rare. Some animals may become sleepy or lethargic for 24-48 hours. These circumstances are usually followed by an improvement in the condition and are an indication that the treatment is working. Acupuncture has been recognized as a beneficial treatment modality by world-renowned medical associations including the American Medical Association, the American Veterinary Medical Association, and the National Institutes of Health.